We saw the usual spikes in Twitter activity and the typical (reactive) launch of crowdsourced crisis maps. 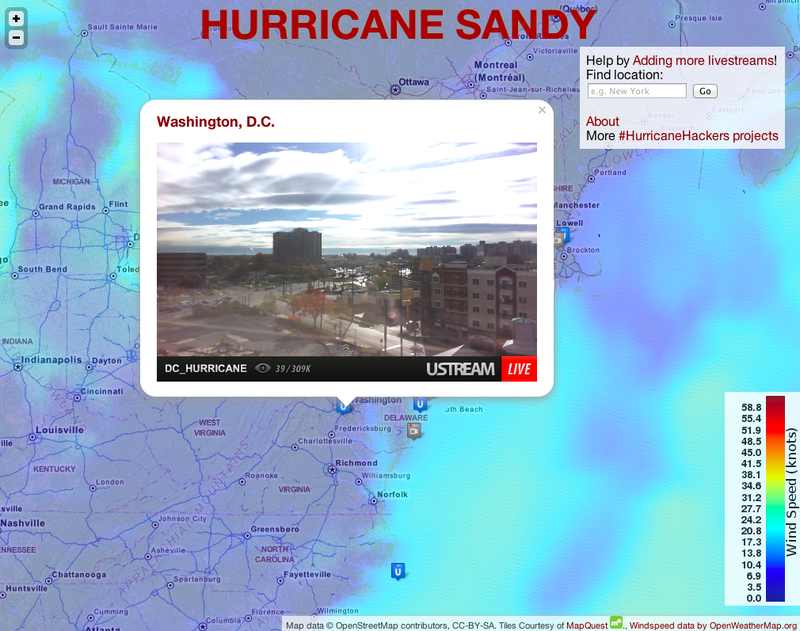 We also saw map mashups combining user-generated content with scientific weather data. Facebook was once again used to inform our social networks: “We are ok” became the most common status update on the site. In addition, thousands of pictures where shared on Instagram (600/minute), documenting both the impending danger & resulting impact of Hurricane Sandy. But was there anything really novel about the use of social media during this latest disaster? I’m asking not because I claim to know the answer but because I’m genuinely interested and curious. One possible “novelty” that caught my eye was this FrankenFlow experiment to “algorithmically curate” pictures shared on social media. 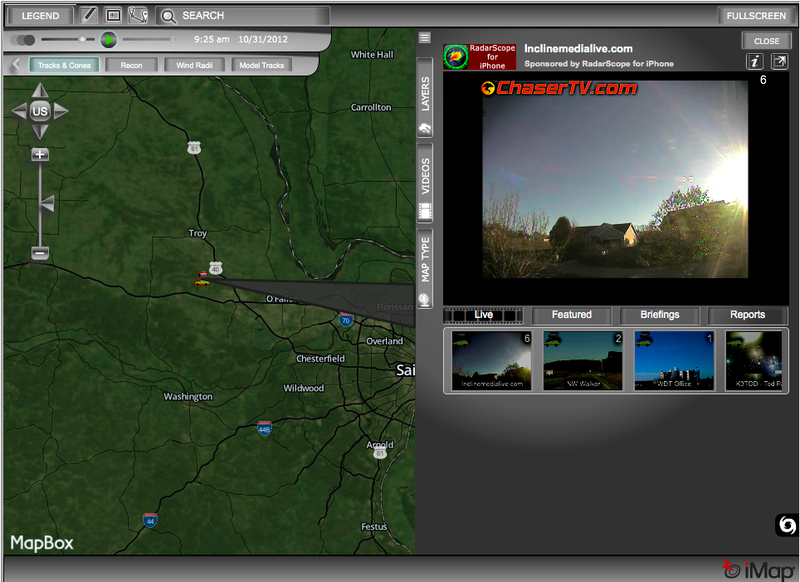 Perhaps another “novelty” was the embedding of webcams within a number of crisis maps, such as those below launched by #HurricaneHacker and Team Rubicon respectively. Another “novelty” that struck me was how much focus there was on debunking false information being circulated during the hurricane—particularly images. The speed of this debunking was also striking. As regular iRevolution readers will know, “information forensics” is a major interest of mine. This Tumblr post was one of the first to emerge in response to the fake pictures (30+) of the hurricane swirling around the social media whirlwind. Snopes.com also got in on the action with this post. Within hours, The Atlantic Wire followed with this piece entitled “Think Before You Retweet: How to Spot a Fake Storm Photo.” Shortly after, Alexis Madrigal from The Atlantic published this piece on “Sorting the Real Sandy Photos from the Fakes,” like the one below. These rapid rumor-bashing efforts led BuzzFeed’s John Herman to claim that Twitter acted as a truth machine: “Twitter’s capacity to spread false information is more than cancelled out by its savage self-correction.” This is not the first time that journalists or researchers have highlighted Twitter’s tendency for self-correction. This peer-reviewed, data-driven study of disaster tweets generated during the 2010 Chile Earthquake reports the same finding. What other novelties did you come across? Are there other interesting, original and creative uses of social media that ought to be documented for future disaster response efforts? I’d love to hear from you via the comments section below. Thanks! This entry was posted in Crisis Mapping, Crowdsourcing, Humanitarian Technologies, Social Media and tagged #Sandy, Facebook, Fake, Hurricane, Instagram, maps, Pictures, Twitter, Webcams. Bookmark the permalink. Really superb curation., Cross posted to Phi Beta Iota the Public Intelligence Blog. 1. There has been a lot of talk in the digital volunteer space about over-loading responders with information. Sandy was probably the first time I saw multiple dig vols slow down and ensure that IF they started working, there was a specific REQUEST and NEED for the information from those doing the work on the ground. This is a fantastic step. 2. I see many people trying to curb the flood of crowdmaps and work collaboratively so that the issue of duplication of efforts doesn’t present itself again. I personally think more should be done in this regard to align crowdmap teams to work together, share data/layers/content/tools and help build a cohesive picture of the entire event, vs dozens of individual maps. FYI – I was guilty of posting a photo of the inspiring Tomb guards that was proven fake (old really, vs fake). I was corrected within minutes. I found it amazing to see how fast (on FB & Twitter) the corrections spread. We all know that the crowd self-corrects, but it’s happening much much faster now, and I think it’s taught everyone a great lesson in verification. Excellent, thanks very much for taking the time to share all this, Melissa, really appreciate it. OWS and their local grassroots participation, an existing social network to reach out to, technical and communication skills. Without peer then and now.